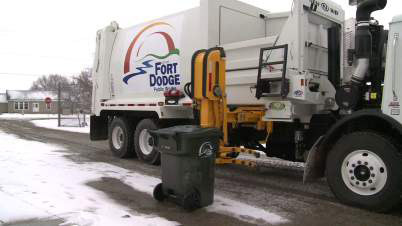 Fort Dodge, IA - The City of Fort Dodge recently put two new trash collection trucks into service that will help make things in their community run a little more smoothly. In 2010, Fort Dodge residents saw a price increase in trash collection that has allowed the city to build up more than a million dollars in reserves. This funding was used to purchase two Sidewinder 31 cu yard automated bodies on locally supplied Mack chassis from Rees Mack Trucks. With the Sidewinder's automated arm, each truck requires only one person for operation instead of two. The purchase makes things easier for customers as well. "Residents will co-mingle all their recyclables into one container. Before they had to separate their cans, bottles and paper for collection, now they can put it into one container. It makes it a whole lot easier for everybody to participate in recycling," says Greg Koch, Public Works Director.